"Thought you might like to see a friendship that has been nurtured by Wiggly Wiggler's mealworms. As the ground had become so dry without any substantial rain for some time I needed extra rations for the blackbirds nesting in the ivy at the bottom of my 60ft garden and also the bluetits in a nesting box on the side of the house. 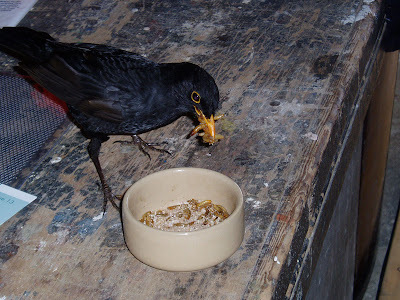 I ordered a supply of mealworms from you and after a couple of days and a lot of patience I had the male blackbird feeding very very cautiously from my hand. It then used to call me for food and even came into the garage/workshop. On two occasions, one when I was using a bandsaw and the other when I was using the lathe with wood chippings flying around I noticed movement beside me. It was my dear little friend who had come into my work area requesting more mealworms for his fledgling family. He even brings his wife occasionally, though she is a lot more timid ! I took the photo when he came into the workshop on to a toolchest on one of his visits." 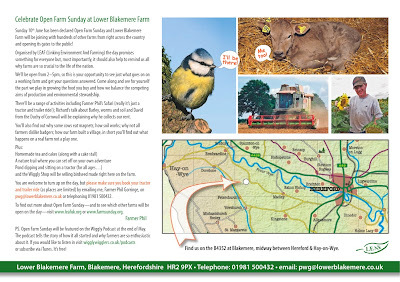 You are invited to celebrate Open Farm Sunday at Lower Blakemere Farm on June 10th 2-5pm. Thank you WiRE women for all those kind comments. Anna Farmery who has based her whole business - The Engaging Brand on this medium. Her blog and podcast are very successful in terms of popularity and community. However the great thing is that she can explain it with a down to earth approach which cuts through much of the jargon based around this new medium. Maybe we need a WiRE day run by Anna to learn more about it all? (She is also speaking at this year's International New Media Expo in California if you feel like a trip off). Krishna De is based in Ireland and her business is all about Brand Building and Business Development, with a particular enthusiasm for the opportunities new media brings. She speaks on Social Media and explains Podcast Sisters in Business Growth News. And then theres me - Heather, my role really is to ask the questions on the show and bring a small business perspective to the whole thing. You can find much more about how Wiggly Wigglers came to podcast - and the facts and figures here which is featuring in Joe Devlin's Business Podcasting Handbook. To follow the launch of The Podcast Sisters subscribe to Women in Podcasting. If you have any questions you would like answering on social media either ask them here - or better still why not try posting them on Anna's or Krishna's Blog? You will see there that Anna, Krishna and myself have formed the Podcast Sisters where you can listen in (free of charge) to our podcasts. Our goal is to provide provide inspiration and guidance for women in Europe on how to engage with the internet to progress their personal and professional goals. As I said I really think that this global form of communication is relevant to many many businesses even if your business is aimed at a local market. Next week's Podcast Sisters podcast will be especially useful to you as it is about Blogging. You can follow when its up on the Women in Podcasting link. If you need help tuning in, or have questions just put them up as comments on this post and we can share information together. If you have technical questions I shall pass you on to Anna and Krishna to comment. Some of you also committed to comment on my blog anyway, so how about reviewing the talk I gave you. Negative or positive, let me know what you think and I can use the comments as endorsements or indeed as learning points. Press on comments, put your text in the box and follow the instructions. Colleen has announced the winners of the first ever Mouse and Trowel awards and we at Wiggly Wigglers are tickled pink to have won The Best Podcast Award! Congratulations to all the other award winners especially Amy and the team at Garden Rant who seemed to win squillions of awards including Blog of the Year, well done all! Great idea by Colleen to start the ball rolling for gardening on the web - many thanks. and the Wiggly Podcast? Well, we love sharing our country life and our passion for helping change gardening from a sterilised, pest free, garden "room", to helping to bring that garden to life. Join in - its fun. The podcast makes my week - tune in, it might make yours too. The Archers - but Real! Phew! An acceptance speech eh? I'd like to thank all the Wigglys and you folks who voted for us, - and the cat! Well Jackie Dixon does really but that doesn't sound as good!! "I just had to let you know that your Paper Potter really is the best thing since sliced bread - even my hubby is impressed (and that takes some doing!). The paper pots are ideal for sowing lettuce - no more fiddly thinning out and I've had almost 100% success rate when using them for those difficult-to-germinate-parsnip seeds (I just hope the parsnips can fight their way through the bottom!). In fact, the Paper Potter is so good, I've just ordered another one for my allotment neighbour who's been trying to make his own paper pots for years!